Another great Sunday Salsa Social at Revolucion De Cuba Manchester in March with a packed dance class plus 140+ dancers attending and dancing to great salsa music past and present. The next party is Sunday 14th April 2019 – NOT the third Sunday of the month this time as that falls on Easter Sunday – the SECOND Sunday this one. Once again we have our resident team of DJ Lubi and dance teacher Gormack Dione but DJ Jane is away so we have a very special guest from Leeds…none other than DJ FABIO BAHIA from Calle Ocho/Fiesta Latina (Revolucion De Cuba Leeds). First, a reminder of who we are and what we do. Sunday Salsa Social at Revolucion De Cuba is now 3.5 years old and is the original Sunday monthly party at the venue. It keeps growing annually with a simple policy of quality salsa dance classes, great salsa music past and present, top professional DJs/dance teacher, a fair door entry price plus a nice casual Sunday vibe that welcomes all salsa dancers, whatever style or level. For this fourth party of the year, we welcome back international salsa dance teacher Gormack Dione, originally from Paris, now based in Manchester. He will be teaching his intermediates level cross-body salsa on1 class from 7.30pm-8.30pm. 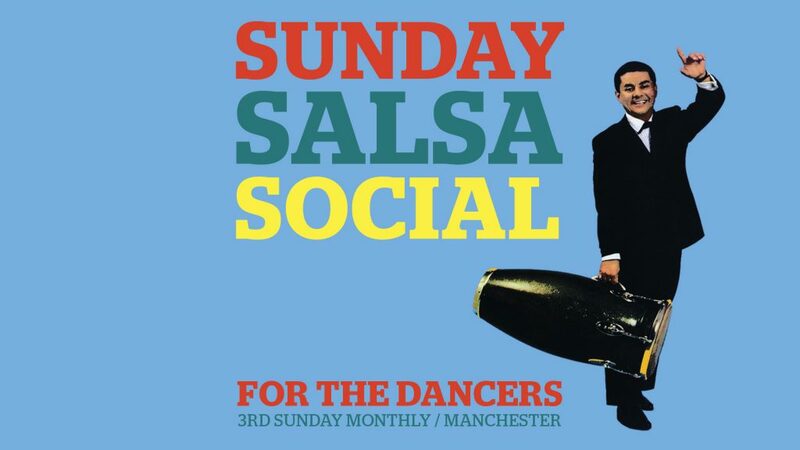 Sunday Salsa Social is promoted by the DJs and not the venue so self-funded from door sales with a small entry charge to maintain the 100% salsa music policy. Class and party is £5, party only is £4. As always, your resident DJ since day one DJ Lubi (Calle Ocho Leeds/RDC Leeds & Manchester) is on the decks. This month, DJ Jane is away so we have special guest DJ #FabioBahia back at Revolucion De Cuba Leeds first time in years. He is one of the original Sunday Salsa Social DJs and also was monthly guest on Wednesday nights Salsa Social for the first 3 years. Co-promoter/resident DJ at Calle Ocho Leeds, he also plays across the UK and guests at Revolucion De Cuba salsa nights in Liverpool, Harrogate, Huddersfield and Sheffield. Over 22 years of DJ experience, he is one of the best salsa DJ in the UK. Great to have him back. We will be maintaining our longstanding music policy of NO BAD MUSIC. Only the best old and new #salsa #mambo #timba #soncubano #chachacha #Latinbugalu #guaguanco #bachata. From La Maxima 79 to Havana D’Primera, Tito Puente to Frankie Ruiz, Oscar D’Leon to Tromboranga, Celia Cruz to Los Van Van. Remember every Sunday, the venue have 2-for-1 deals all day/evening on all tapas and all cocktails including non-alcohol “mocktails”.